Claudio MONTEVERDI: L’Orfeo (1607; trans. R. Alessandrini 2006-07). Cast includes: Monica Piccinini, Furio Zanasi, Anna Simboli, Sara Mingardo, Sergio Foresti, Antonio Abete, Luca Dordolo, Raffaele Giordani, Gianluca Ferrarini, Marco Scavazza. Concerto Italiano, Rinaldo Alessandrini (cond.). Naïve OP 30439 (2CDs with book) (http://www.naive.fr/). Distributed in the US by Naxos (http://www.naxos.com/). With broad, sweeping strokes, Alessandrini brushes away years of dust and speculation. Contrasting a recent Stephen Stubbs Opus Arte DVD set (OA 0929 D) or even Gardiner’s exemplar (Archiv B0000057CV), the stately ritornello that frames the opera becomes unexpectedly bright and vigorous. Further surprises lie in wait. Alessandrini’s retouchings and direction crystallize layers, voices and textures. The varied support (chitarrones/theorbos, archlutes, arpa doppia, harpsichord and organs) does add a somewhat vulgar quality, refreshing in the light of attempts at elite, fastidious practice. The small band of singers is fine: While their eagerness may surprise, the energy propels the “underworld” acts (where, frankly, this listener tends to lose interest). Naïve offers a lavish book interleaving an odd mixture of photos and art reproductions with Alessandrini’s extensive essay and the libretto. As a bonus, there’s a curious story by Camille Laurens which posits Orpheus’ contradictory motivation. Henry PURCELL: Dido and Aeneas (1689? ; reconstruction by A. Cremonesi). Cast includes: Aurore Ugolin, Reuben Willcox, Deborah York, Fabrice Mantegna, Céline Ricci, Eberhard Francesco Lorenz, Michael Bennett. Akademie für Alte Music Berlin, Vocal Consort Berlin, Attilo Cremonesi (cond.). Choreography: Sasha Waltz. Arthaus Musik 101 311 (1 DVD) (http://arthaus-musik.com/). Distributed in the US by Naxos (http://www.naxos.com/). Presented on DVD, the opera profits in some measure from Sasha Waltz’s choreography. The Prologue (it’s not clear to me what music is used here as Purcell’s original is lost) opens to a brightly lit, water-filled tank in which dancers cavort. Motion through water requires deliberate movement, echoed in the opera’s staging, which evolves to a more conventional surface. The filming, here especially, is too tightly focused or loosely remote, with little middle ground. The singers’ appearances reset expectations for a more predictable approach, even though the dancers flow busily around them. The extended Ballet School at Act I’s close is a bit silly but does provide contrast for the melancholy denouement. The lurking question: What will happen at the lament? Fortunately, most of the dancers recede, and we’re left with a fine Dido (Aurore Ugolin) and her doubles, who become entwined in hair. Throughout the Akademie für Alte Musik Berlin plays splendidly. The grounds (variations over a repeating bass line), such as Cupid’s Dance, are inspired. Chorus and vocal soloists persevere despite what might have been immensely acrobatic and potentially distracting. Despite the engaging visuals, I anticipate listening to this more than viewing it. 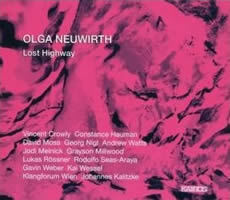 Olga NEUWIRTH: Lost Highway (2002-03). Cast includes: Constance Hauman, Georg Nigl, Vincent Crowly, David Moss, Andrew Watts, Kai Wessel, Gavin Webber, Grayson Millwood, Rodolfo Seas-Araya, Lucas Rössner, Jodi Melnick. Klangforum Wien, Johannes Kalitzke (cond.). Kairos 0012542KAI (2 SACDs) (http://www.kairos-music.com/). Distributed in the US by Albany Music Distributors. Not recommended for the prudish or easily agitated. It’s best to listen in full view of exits and daylight. David Lynch’s ambiguous Lost Highway has a cult following which this Neuwirth/Jelinek concoction perpetuates. Rubbing up against opera’s boundaries, the text is mostly spoken, infrequently warbling across a jangling, hyperactive score. Several characters employ a disturbing falsetto, and the profuse electronics and spatialization contribute to a heightened experience. Typical of Lynch, the action defies capsule description: The male lead experiences a crisis with his wife (but has he really killed her?) and abruptly becomes a different person wedged into sordid situations, his new identity paralleling his old. Judging purely from this Kairos production, I’m not sure the means justify the end. Esoteric notes and an awkwardly formatted, multilingual synopsis mirroring the baffling plot do not convince me that Neuwirth really needed to do a turn on Lynch’s movie. She has the chops, yes, but must cutting-edge productions be nonlinear and violent? Certainly, from Neuwirth, we should expect forceful obscurity. An earlier Kairos release of chamber music (Kairos 0012462KAI) concentrates on strings and piano diffracted through percussion and electronics. Employing a boxcar of extended techniques, it requires persuasive players such as the Arditti Quartet, Nicolas Hodges (piano) and Garth Knox (viola d’amore) to make cryptically titled works convincing (Akroate Hadal, …?risonanze!…, incidendo/fluido, etc. ), and Kairos does its magic as well, capturing Knox’s effervescent, mistuned viola d’amore. One is left wondering whether Neuwirth’s prowess would seem as persuasive were she to tackle more conventional tasks. Chaya CZERNOWIN: Pnima… Ins Innere (2000). Cast includes: Philip Larson, Tom Sol, Ute Wassermann, Silke Storz. Experimental Studio of the Heinrich Strobel Stiftung SWR: André Richard, Michael Acker, Reinhold Braig (sound direction). Anthony Burr (clar), Rico Gubler (sax), Andreas Eberle (trb), David Shively (saw, percussion), Mary Oliver (vla), Frank Cox (vlc), Munich Chamber Orchestra, Johannes Kalitzke (cond.). mode 169 (1 DVD) (http://www.moderecords.com/). Czernowin’s opera grasps at the unnamable and incomprehensible. A traumatized Holocaust survivor cannot connect with his grandson. Later, the grandfather dies and the child constructs his own crushing reality. Two actors, the “old man” (Richard Beck) and the “young boy” (Elias Maurides), appear on stage, each paired with two offstage singers. However, there are no arias or texts, merely vague vocalizations over Czernowin’s caustic score. The music is powerful enough not to require the activities and bleak set over which we see projections of movie clips and photos. Czernowin’s music, airy and grotesque, sounds indeterminate when, in fact, it is precisely notated. The composer tends towards nonstandard means. The notes mention a musical saw, plastic bag, rice on a vibraphone and dry branches on drums. The overall effect is otherworldly and disturbing. Quite possibly total immersion and concentration would provide a more complete experience. For this viewer’s part, my attention flagged. 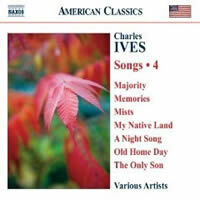 Charles IVES: Var. songs (1887-1926). Var. artists. Vol. 1: Naxos 8.559269. Vol. 2: Naxos 8.559270. Vol. 3: Naxos 8.559271. Vol. 4: Naxos 8.559272 (http://www.naxos.com/). 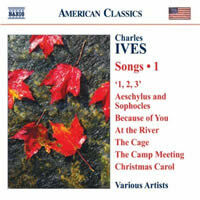 Part of the charm of Naxos’ edition of Ives songs, which will number 183 in six volumes, is the arrangement of titles in alphabetic order. Juvenilia sit next to mature pieces, school cheers bump against Germanic art songs and patriotic shout-outs. Familiar numbers like Ann Street, The Cage, General William Booth Enters into Heaven and The Housatonic at Stockbridge pop out now and again, and the singers — male, female, some choruses, the occasional countertenor — provide an added aspect to the variety. 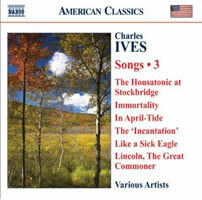 The lot (I base my remarks on the four installments released so far) appears to have been recorded in 2005 under the auspices of Ives’ alma mater, Yale University. The singers are mostly emerging artists, several having worked at the Met and New York City Opera. Their exuberance and naïveté infuse these songs with an earnestness I suspect would have pleased Ives. For those preoccupied with shelf space, I hope Naxos will offer the complete collection in an efficient package. As it is, the texts are available online. Virgil THOMSON: The Plow That Broke the Plains (1936); The River (1937). Accompanying films by Pare LORENTZ. Post-Classical Ensemble, Angel Gil-Ordóñez (cond.). Naxos 2.110521 (1 DVD) (http://www.naxos.com/). Standing alone over here, outside in the dust, maybe you can hear me. 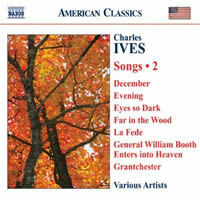 Others have branded these two Thomson scores his best work, proclaiming how they defined American traditionalism with modest folk tunes and plain harmonies. Usually I prefer more spice but can enjoy mildness if aptly applied. Despite praise by none other than Copland, these scores strike me as ear candy. Four Saints in Three Acts works for me because it’s absurdly two-dimensional. When Thomson strives for seriousness, his music becomes fallow. It doesn’t help that Pare Lorentz’s movies document America’s blowhard shortsightedness: the destruction of the plains through overfarming, and how Northern deforestation led to Southern flooding. Of course, these were New Deal propaganda reels, but to witness critics heaping praise upon Naxos’ reconstruction suggests brainwashing and ignorance. Hurricane Katrina proves we’re incapable of profiting from history. Indeed and alas, but all is forgiven if the music’s cute. This new package marries Floyd King’s stentorian narration over fresh soundtracks recorded by the Post-Classical Ensemble under Angel Gil-Ordóñez. I found it all rather creepy and depressing. 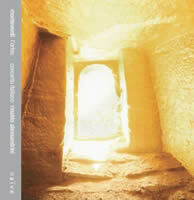 Thomson’s full scores, including music that never made the transition to film, are available on Naxos 8.559291.